It is said that this event, much like the sinking of the USS Maine for the Spanish-American War of 1898 -just 17 years before-, the Gulf of Tonkin incident in 1964 -an admitted false flag- for the Vietnam War, 9/11 for the invasions and occupations of the poppy fields of Afghanistan and oil wealth of Iraq, and similar narratives as the burning of the Reichstag, the “testimony” by ambassador daughter Nayirah on 10-10-‘90, no less, and many others, was the reason the US “got into” World War I. From the onset, that part of the plot already seems odd (“it rhymes, so it’s true” is a Dutch saying). The US, according to the his-story books, entered WWI late, in 1917. That is nearly 2 years after this event happened, or “happened”. On the other hand, those poor brainwashed US soldiers were trampling Afghan soil by December 2001, a mere 3 months after the alleged “terror attack” in NYC, Pennsylvania and Washington D.C.?? As a starter, I would like to invite you to just read the story -and what better source is there than schizowikipedia?- from beginning to end. Not out of “laziness” on my part, but because I think what the Jonestown series nicely demonstrated, is that a group effort where different pieces of mind look into a narrative, gives a much broader view. In the end, we are all putting the pieces of the puzzle together, and my own take on the story is not and should not be leading. Just read it, it’s fun. And in the comments we can unwind this spaghetti story more together. Posted on September 2, 2018 September 19, 2018 by gaiasspherePosted in Fabricated News, Fear mongering, History, Propaganda, WarTagged Ireland. This incident has more rabbit holes than Elmer Fudd’s back yard. But assuming it was a fake event, would 764 have sailed onboard and then later be called survivors? That is a large hoax to maintain. Wiki is littered with spook markers, far more than usual. Has anyone wached the National Geographic special where they visited the wreckage, situated 11 miles offshore in 330 feet of water? I do hope people take up the challenge. I’ll do what I can, as reading the Wiki page on the event assured me it was/is fake. They only needed to change the name of the vessel, as with Titanic and Olympia. I didn’t even need to visit the page to know that you are referring to Rita Jolivet. She was going to be, along with Mary Pickford, a highlight of my next “Sewing Circle” article. Jolivet climbed onto a chair and obtained a life preserver that was in her stateroom. She plunged into the Atlantic Ocean. She was saved with others when boats arrived from Ireland. Riiiiiight. I’m sure it happened just like that. The Carpet from Bagdad is a 1915 American silent adventure film directed by Colin Campbell and based on Harold MacGrath’s 1911 eponymous novel. In the story, Horace Wadsworth (played by Guy Oliver), one of a gang of criminals also planning a bank robbery in New York, steals the titular prayer rug from its Baghdad mosque. He sells the carpet to antique dealer George Jones (Wheeler Oakman) to fund the robbery scheme. But the theft places both men and Fortune Chedsoye (Kathlyn Williams), the innocent daughter of another conspirator, in danger from the carpet’s guardian. 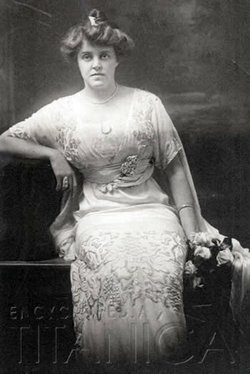 Williams was married three times. Although many biographies erroneously cite her first husband as being Victor Kainer, he was in fact named Otto H. “Harry” Kainer (1876–1952), who ran an import and export business on Wall Street in New York City. They were wed on October 2, 1903, and their son, Victor Hugo, was born in 1905. The Kainers resided at 301 Nicholas Avenue in Manhattan. On May 8, 1905 [10 years -1 day before “Lusitania”], she successfully sued her husband for $20,000 for not paying her $10,000 on the day of their marriage [??] and for every year of their marriage. The case made headlines in newspapers across the country, and made its way to the New York Supreme Court. They supposedly divorced over Kainer’s disapproval of his wife having an acting career,and Williams subsequently obtained a divorce from Kainer in 1909 in Nevada. On March 4, 1913, she married Frank R. Allen, also an actor, but the marriage was a failure from the start and lasted a little over a year. She later married Paramount Pictures executive Charles Eyton on June 2, 1916, in Riverside, California. Like many films from the silent era, The Carpet from Bagdad was believed completely lost, but in 1982 an Oceaneering International diving expedition salvaged a number of artifacts from the wreck of the RMS Lusitania, including one reel of film. On February 25, 1922, her son, Victor, died suddenly at the age of 16 from complications of influenza at Good Samaritan Hospital in Los Angeles, and his remains were cremated. Her son was previously enrolled at Harvard Military Academy before he became a student at Hollywood High School. Apparently Victor chose to pursue his acting career COVERTLY. Of course, the famous writer Victor Hugo was born to military royalty. Josephine Brandell survived. Josephine Brandell married her fourth husband, Beresford Cecil Bingham, the 8th Earl of Annesley, and 9th Viscount of Glerawly, earning her the title of “Countess of Annesley.” She had no descendants despite four marriages. Amelia Herbert perished (aged 58) six years after the death of her husband. They had no descendants. *Did her mother OWN the homes she rented out? Read about Clark in a book called “Montana, High, Wide and Handsome.” In those days US senators were appointed, and if I recall correctly, Clark was the one who got the seat by openly handing out cash bribes on the state senate floor in Helena. Here’s a neatly coincidental 140th anniversary today, September 3 – the sinking of the Princess Alice in the Thames in London with an unbelievable 650 dead! This script was resuscitated for the sinking of the Marchioness in the same river in 1989 with an alleged drowning figure of 51. Absolutely ridiculous! Your link was written by a BBC reporter named Alice based on information provided by a fiction writer/former cop. From the linked article: The vessel sliced the Princess Alice in two with a sickening crash. “The panic on board was terrible, the women and children screaming and rushing to the bridge for safety,” Merryman’s witness account reads. Panic was terrible. Vessel sliced in two. Women and children screaming. So the survivor Merry Man and the captain decide to engage in conversation! “We are sinking.” Gee, thanks Captain Obvious! Same old format – no bodies, empty coffins, acres of news coverage, a lengthy inquest, the familiar memorial, lying witnesses.. Tried and tested and still being used today for every staged major fire/crash/”terror” attack 140 years on. Noticed one passenger was called Theodate Pope Riddle. Sounds like a Dan Brown book. Ha, the saying is way older than that movie, which I enjoyed as full of references to mind control, as a kid when I was playing with Lego we used it already. Churchill let it happen on purpose. Churchill subsequently blamed captain Turner, who seemingly was a hero. That is misdirection … remember, if they can get you to ask the wrong question, get you to chase the wrong rabbit, your thoughts and answers do not matter. This is how people in power work – they don’t lie to us. They misdirect. Was it the CIA or the mob that offed Kennedy? Actually, neither. He didn’t die, not that day, anyway. For something to “let it happen on purpose”, there still needs to be something happening. It is that question that is interesting. Did NORAD “let ‘it’ [what?’] happen on purpose”? And why Churchill? Is the head of the British Admirality the only player in this story full of plot holes? Turner a hero? You know he was heavily interrogated and left public life shortly after? Hmm, not much of a hero, is it? • Why was Turner replacing the normal captain just for this voyage? Coincidence or convenience? In the end, a reliable actor is needed to play a role. And actors enough on board of the Lusitania. • Why was the Lusitania going so slow in the most dangerous waters? They tell us it was to arrive in Liverpool at high tide (makes sense) and not wait close to the safety of the harbor for making land (does not make sense). The British coast is easier to defend than open Irish sea. • Why did so many rich-‘an-famous people (think about that other movie script 3 years before, of the Titanic, that actually was based on a novel!) board that ship after all the warnings in the newspapers in the preceding weeks? You know when it’s snowy or icy in winter they send out warnings “not to go on the streets unless you have to”? The famous scene of Die Hard with a Vengeance springs to mind when thinking about this, the one where Bruce Willis walks through Harlem with the sign “I hate niggas” around his neck.